Bullet blenders are all the range in the healthy eating community because they are compact, portable and efficient in turning healthy and nutritious ingredients into yummy smoothies. 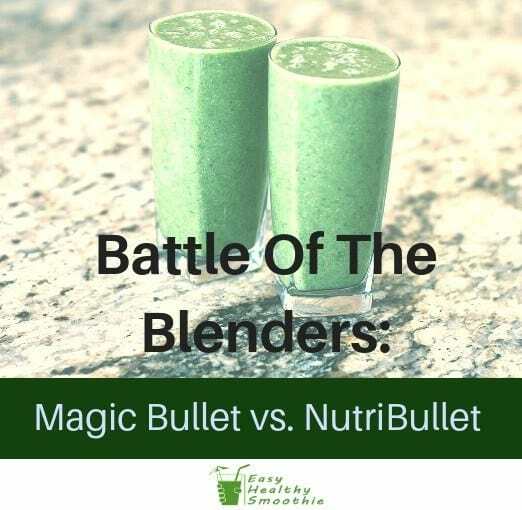 Two of the best brands of bullet blenders available today are Magic Bullet and Nutribullet. To make it easier for you to choose which one to go for, we’ve compiled our research about these bullet blenders in this review. Let’s start by summarizing what we discovered about these bullet blenders. The compact design, which makes them ideal for smaller kitchens and those who prepare single-serve portions. They share the same simple user interface. This allows you to blend hands-free or with the pulse mode by pressing down on the jar. Mostly dishwasher safe except for the blade. Highly rated by customers, especially those who understand the capabilities and limitations of single-serve bullet blenders. Being able to prepare a healthy drink or dish is challenging but with the right tools, it can be easy, fun and exciting. Bullet blenders like the Magic Bullet and NutriBullet are great tools that can help you feed your body with nutritious foods. In this review, you’ll be able to see these two brands’ features, pros and cons and what others have to say about using them. We’ve done all the research so you will be able to make a more informed decision about which one to purchase. These two brands are popular bestsellers, but that doesn’t mean you should simply follow the crowd. The overall power of your blender and whether it can get the job done the way you like. Do you prefer velvety smooth drinks or don’t you mind some chunks? A user-friendly interface is also important because you wouldn’t want a blender that you couldn’t figure out how to operate. Ease of cleaning is also important because most people won’t enjoy using a blender if it's too difficult to clean. The price compared to the features the blender offers. The Magic Bullet is known for being one of the most affordable single-serve bullet blenders. Apart from the attractive price, this product also has useful features that help make it so popular. The Magic Bullet is a personal blender that takes up a very small space on your countertop, kitchen cabinet or any storage place. Plus, it’s also portable and light compared to other blenders. The base is slightly larger than a mug and even with the jar fitted on, it can still fit under a kitchen cabinet. Also, there are models available in different colors. Magic Bullet Blenders use 120-watt and 250-watt motors. Even if these aren’t the most powerful motors, they can still create smoothies, blend, chop, mix and grind. The sharp, stainless steel blades spin at high speeds, creating blended smoothies, drinks, soups, salsa, and other healthy dishes. Although it is possible for small chunks to still be present after 10 seconds of blending, this can easily be remedied by prolonging the blending time. Adding more liquid can also help produce a smoother consistency. A powerful but over complicated blender is useless if you can’t work out how to use it. The Magic Bullet is very easy to figure out and all you have to do is place the ingredients in the jar, screw the blade lid, align it with the base then lock it in place to start blending. Additionally, pulse blending can also be done by simply pressing down on the jar when it is not locked in place. Most Bullet Magic sets are generous with the number of accessories or pieces that they come with. Sets usually include a base, a blending jar, blade lid, party cups and stay-fresh lids. Furthermore, additional accessories such as the blades, cups, and lids can also be purchased as replacements or backups. You will certainly decide to use this blender again and again because it is very easy to clean. The tight seal between the lid and the jar ensures that it doesn’t leak into the base while blending. Furthermore, the jars, cups, and blade are also very easy to clean. A useful trick is to place soapy water on the jar, place the blade lid and blend. This removes the leftovers on the blades so you can simply rinse it afterward. The jars and cups are dishwasher safe so you can place them on the top rack of your dishwasher if you don’t want to wash them manually. Many customers say that for the price, this is a pretty decent blender, especially for drinks. It isn’t designed to take on more powerful all-purpose blenders but it can do a lot for its small size. Some customers love its small and compact size because it is perfect for single servings and the included party cups with stay fresh lids are perfect for when you’re on the go. However, there are still those who are disappointed with the power it offers because it doesn’t compare to more powerful blenders. Additionally, some customers who bought refurbished units have ended up with broken ones. NutriBullet blenders are known as “nutrient extractors” and they achieve this by pulverizing and crushing fruits, vegetables, seeds, and other parts of plants that are high in nutrient content. One of the best features of NutriBullet blenders is their powerful motors. Motors have between 600 and 1700 watts, depending on the model. This kind of power enables the blades to spin at a very fast speed, no matter what ingredients are in the way. This is why NutriBullet blenders are the best choice for those who also include leafy vegetables or ingredients with stems in their dishes. Furthermore, this blender also unlocks the nutrients trapped inside the cell walls of various ingredients. This leads to a delicious smoothie that is also nutritious and healthier. The powerful motor also aids in creating various dishes and not only smoothies. It can be used in grinding rice or wheat to create flour, whipping for desserts and ice cream, mixing for sauces and dips, as well as creating nut butter. Another great feature of bullet blenders such as the NutriBullet are their small size. This enables you to easily store and position the blender on your countertop without it taking up too much space. As a single-serve blender, the NutriBullet is perfect for small kitchens or those who don’t need to prepare a lot to feed the whole family. It is a great addition to those who live in small apartments, dorms or those who have smaller family members. Washing after use is a breeze with NutriBullet blenders. The cups and lids are all dishwasher safe but you can still wash them manually by hand if you prefer. The only parts that are not dishwasher safe are the blades. These should be easily washed by hand with warm soapy water. Many customers are impressed with the power of NutriBullet motors. The NutriBullet 1700 RX is the most powerful at 1700 watts. This ensures the smoothness and silky texture of the end products. Many customers also love the compactness and portability of these products. People love that a single-serve NutriBullet blender can do a lot more than just make smoothies. On the other hand, some buyers are a bit disappointed with the limited number of accessories included in the sets. To make things clearer, here are a few differences between the two brands so you can see which one would better fit you. The Magic Bullet is far more affordable than the NutriBullet. NutriBullet blenders have more powerful motors and are more capable of processing a variety of ingredients. NutriBullet has better ratings than Magic Bullet. You get more accessories or pieces in the sets offered by Magic Bullet. The best bullet blender for you will depend on your needs and preferences. This review is just here to provide you with information that can help you know what to expect from each brand. Personally, budget permitting, we’d choose the NutriBullet because it has better features. On the other hand, Magic Bullet blenders are still great for their price. They can still blend and create healthy smoothies and dishes, although a little adjustment might be needed in order to get the consistency you’d like.